The genius of a slow cooker lies in its ability to cook unattended, making it an obvious favorite of working parents and other busy cooks. Plenty of people haul out the slow cooker in the winter when soups and stews appear on the family dinner menu. But this versatile countertop appliance deserves to stay front and center in your kitchen all year long. In summer, use it to make cakes, pies, quick bread, cobblers, brownies and other baked goods without heating up the oven and consequently, the house. Some desserts you can make right in the ceramic insert that came with your slow cooker. Cobblers, crisps, crumbles and the like don't rely on a structured appearance, so you can toss the ingredients in free-form and serve warm scoops straight from the crock when it's done. Cakes, pies, and bread, on the other hand, require a little more control. Some slow-cooker manufacturers sell baking inserts. But you can also use your slow cooker like an auxiliary oven and stick your baking dish, cake pan or pie plate into the standard insert that came with it. It helps to use a short wire rack to raise your pan off the bottom so the heat can circulate all around it as it does in a conventional oven. But if you don't have one, you can fashion your own using oven-proof small ramekins, a metal trivet or even aluminum foil wadded into tight enough balls or strips to provide stability for your pan. Grease the ceramic insert with non-stick cooking spray or a light coat of neutral oil if you plan to cook directly in it. You can also line it with parchment paper for some recipes, which makes it easier to lift the dessert out when it's done. Just be sure to extend the paper up over the sides of the crock. Match your bakeware to your slow cooker. Standard round 8-inch cake pans fit in a 6-quart round slow cooker. Larger models can accommodate 9-inch pie plates. Oval 6-quart models can usually handle average bread pans and small rectangular baking dishes. Some muffin tins fit in the larger 8-quart models or squared-off multi-cookers. Fill the crock or baking dish to halfway to avoid scorched desserts. This also allows room for rising. But don't go past two-thirds full even for dishes that don't need expansion room. Keep the lid on the slow cooker for baking, but slightly ajar so condensation can escape. If your recipe requires a tight seal, loosely cover your dish with a piece of parchment paper or aluminum foil to catch any drips. Pour an inch or two of water in the bottom to protect ceramic slow cooker inserts when you contain your ingredients in a separate dish or pan. Use high heat, unless your recipe specifies otherwise. Don't lift the lid until you're ready to check for doneness. 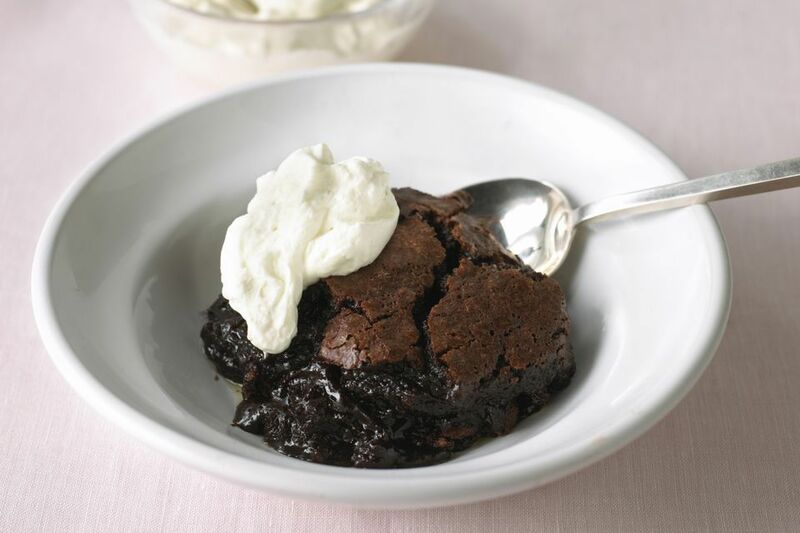 Allow the dessert to cool in the slow cooker for about 15 minutes before you serve it or try to remove it.